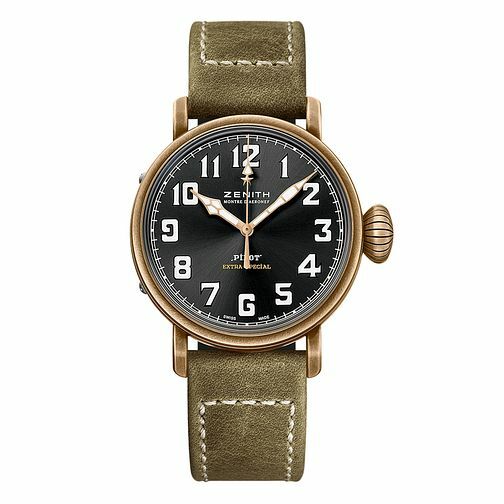 Drawing inspiration from aviation instruments, this Zenith Pilot Extra Special automatic watch brings the tradition of Zenith's legendary past to the present day. This beautifully crafted Swiss-made watch boasts a stunning 40mm stainless steel case, and a sapphire crystal which protects the dial. The green dial is complemented by the khaki tone leather strap. Water resistant to 100m, this charming watch is powered by the Zenith Elite 679 automatic movement with a minimum power reserve of 50 hours. Stylish and functional, this Zenith watch classic Zenith watch is an investment piece that will see you through the years, and never go out of style.